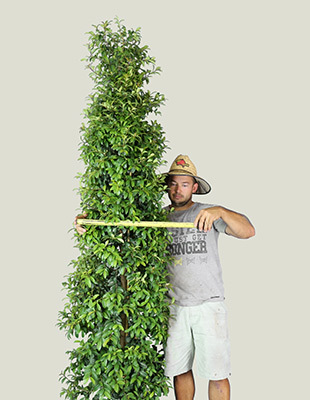 Description: Straight and Narrow™ Syzygium is a very slender, semi-compact and dense plant. It has tight, attractive leaves and white flowers that proceeds to beautiful pink/red fruit. Size: 5-8m high x 1-1.5m wide. Can be pruned down to 2m. 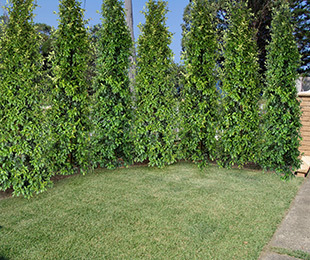 Uses: Perfect for constricted planting areas, such as along fences and driveways. Also works well for topiary. Position: Full sun to shade. Suits most, well drained soil types. Tolerates cold and dry. Care: Water as required for 8-13 weeks until established. Plant in a well mulched garden (chunky mulch is recommended). If required use slow release fertiliser in spring. Prune twice yearly for a very tidy hedge or every 2-3 years as a wider screen plant. Natural Pysllid resistance makes it unlikely to have this problem. Where it works: QLD, NSW, VIC, SA, WA & ACT (if protected from frosts).